State weather forecaster said that Typhoon Huaning has maintained its strength and speed as it moving in a west northwestward. Typhoon "HUANING" was located based on all available data at 900 km East of Itbayat, Batanes, according to PAGASA. 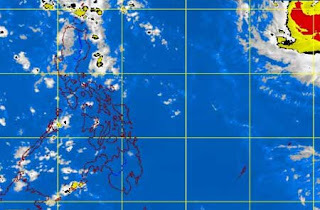 PAGASA weather bulletin as of 5:00 am today, "the eye of Typhoon "HUANING" was located based on all available data at 910 km east of Itbayat, Batanes (22.0°N, 132.0°E) with maximum sustained winds of 175 kph near the center and gustiness of up to 210 kph. It is forecast to move West Northwest at 20 kph. " PAGASA raised public signal no 1 in Luzon particularly in Batanes Group of Islands with 45-60 kph winds. PAGASA advised fishermen specially those using small seacrafts are not to venture out into the Northern and Eastern Seaboards of Luzon due to big waves generated by Typhoon "Huaning". Comments or suggestions about "Typhoon HUANING PAGASA Update | July 2013" is important to us, you may share it by using the comment box below.